Manage your MySQL database with Adminer from October backend. This plugin creates a private instance of Adminer in October backend. 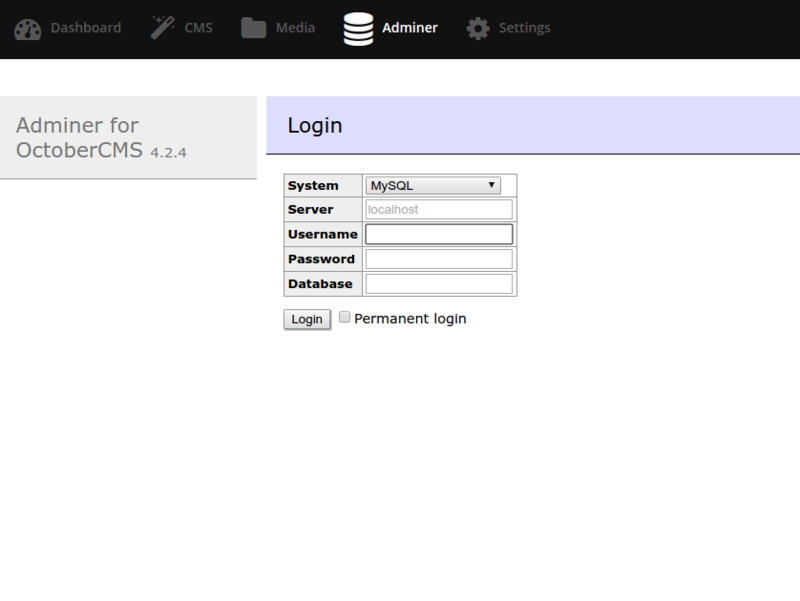 Adminer is a database management tool (written in PHP). Currently supports MySQL, PostgreSQL, SQLite, MS SQL (and many more). It's a fast and light-weight alternative to phpMyAdmin (more info on this). You need to be logged on October Backend to access Adminer. Also, you can give permissions to your backend users but remember, they are going to have access to the whole October database (or databases, depends on your db user privileges). The plugin is fully functional but i'm open to suggestions/ideas. In your OctoberCMS backend, go to Updates > Install plugins and search for "martin.adminer" or install from October Marketplace. Click on the toolbar button and manually insert your database credentials. Very useful plugin! Simplifying direct database access. I love this so much! Will this plugin eventually support the Adminer themes available on adminer.org? Hello Ethan, thanks for your kind words. Themes will be available in the next version.